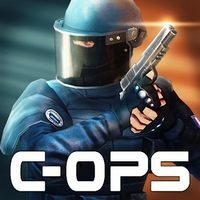 A dynamic online shooter game, often referred to as a mobile CS. Critical Ops was made by Finnish studio Critical Force Entertainment, known for a similar production - Critical Strike portable. Critical Ops for AND and iOS is a dynamic first person shooter game, inspired by Valve’s productions. It is sometimes referred to as the mobile answer to Counter Strike: Global Offensive. The game was created by Finnish studio Critical Force Entertainment, known for a similar production, called Critical Strike Portable. Critical Ops game debuted as an alpha version in 2015 and has been systematically expanded and developed since then. The game is free to play, although it features optional micro transactions. Like in CS:GO, the players take on the roles of anti-terrorists and terrorists, fighting in cleverly designed arenas and trying to fulfill their objectives — at first in the Defuse the Bomb mode. You can use a wide range of weapons (such as pistols, submachine guns, assault rifles, shotguns, ans sniper rifles), as well as additional equipment (several kinds of grenades, bulletproof vests, helmets), which can be bought in the in-game store with the money you earn during battles, as in CS:GO. The battles, taking place on several available maps (Amsterdam, Barcelona, Tokyo, Bureau), can involve up to 20 players. They can either be complete strangers or groups of friends. The game also allows you to create clans and participate in tournaments (the developers emphasize the e-sports aspects). Critical Ops for AND and iOS features high-quality 3D visuals. The level designs are particularly interesting—they're well-thought, large and very detailed, which adds charatcer to the battles and creates new combat possibilities. The game also features expansive controls customization, based on virtual analog knobs and buttons shown on screen. You are free to change their layout as you please. The game utilizes a well-thought free to play. As a result, you can play the game free of charge, because the developers have chosen not to introduce any pay-to-win elements. The micro transactions are there first and foremost for customization purposes (you can buy e.g. unique weapon textures).